Pentax USA just recently offered a few rebates on their cameras and lenses. While I won’t go into the issues regarding fluctuating lens prices here (making the rebates utterly pointless), I will say a few of the camera bodies did see some decent price reductions. The Pentax 645D is only $8,799.95 now, a $1200 price reduction (It just so happens the 55mm f2.8 lens is $1200…). My guess is that they will be announcing a replacement this month at Photokina. I had the pleasure of using one for a short time a few years ago. I was generally impressed with the camera, but even at that time saw a few issues that should have been better considering the level that camera is at. The thing was slow and didn’t have all of the features a normal 35mm SLR would have. Keep in mind the 645D was more targeted to this side of the market than it was to those ludicrously expensive medium format back and systems. While I’m not currently financially capable of owning one of these, it would be a great tool and I would welcome one if the chance ever arrives. If you happen to be in the market, I’d suggest waiting at least a month. Like I mentioned, there is a good chance that the 645D will see a revision that will at the very least replace the sensor because the Kodak one is not longer available. I think along with that, they will improve the speed of the camera, which I thought was a main stumbling point of the original camera. My guess is that they will keep the existing body design, but I would hope that they consider making the camera smaller and I suspect there is empty room inside the camera that can be trimmed out. Considering the release of cameras like the Nikon D800, I think the 645D is in a difficult position. Yes, the sensor is physically larger than a full-frame 35mm (860mm^2 to 1450mm^2 of the 645D… it is a crop sensor itself at 0.78x that is not a true 6 x 4.5 cm size), but it is a similar difference as APS-C is to FF. I think it will be difficult for people in that market to justify the cost of over double for what amounts to sensor size being the only edge it has over a D800. If the 645D were around $4999, I think they would be in a much better position to take that market by storm. Regardless, I’m looking forward to seeing the replacement. 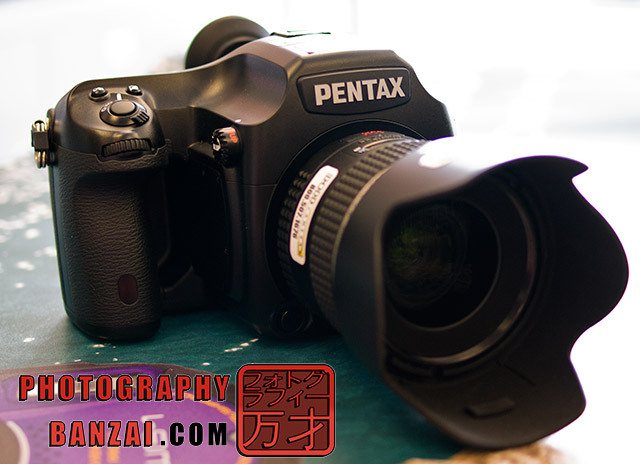 This entry was posted in News, Opinion, Web and tagged 2012, 645D, opinion, pentax, photokina. Bookmark the permalink.